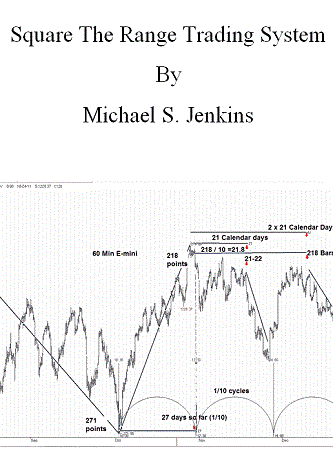 After 42 years of in depth study of charts Michael Jenkins has deciphered the breakthrough key element of every chart that reveals all the fluctuations in the future with a simple technique that anyone can use and understand with only a brief introductory education on reading a chart. There is no longer a necessity to use moving averages, or advanced technical tools or expensive cycle programs. A simple chart and trendline and perhaps a circle will give you everything you will ever need to trade on ANY time frame from 1 minute to monthly. Obviously such a simple approach might miss a few small signals but that’s usually only because of the inaccuracy of the chart or the users drawing skills. The vast majority of major turns can be easily spotted and a simple trading plan developed for execution on key dates. This S&P daily chart from the March 6, 2009 low was quickly constructed in less than two minutes with this technique, but keep in mind that the book shows several advanced methods to see the ‘patterns’ that repeat as well as the ‘mirror image’ repetitions.